This scenic park with fruit groves is an interesting place to walk and sightsee. You can see the city skyline, buy or pick some fruit, and see the sculpture of Mao&apos;s head. Suited to: people who like walking in gardens and parks. Claim to fame: it is unusual to have such a large scenic park and recreation area in a middle of big city in China. It greatly improves the environment, and makes Changsha a better place to live. This narrow island in the middle of Changsha is probably the second most popular attraction for tourists after Mount Yuelu. There are gardens and thousands of fruit trees, frequent grand firework displays in the evening, and a big statue of Mao&apos;s head. Orange trees: The island is named after the hundreds of orange trees. The orange trees bear oranges in October and are for sale. The prices per fruit is marked by signs on each tree. 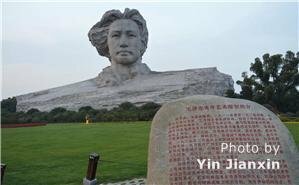 Mao statue: The statue looks like it is carved from rock, but it wasn&apos;t. It was constructed in 2009 and is 32 meters high. It sits at the tip of the island. River scenery: You can see the Changsha skyline during a walk along the riverside. The island is 8 kilometers or 5 miles long, and would make a good place for a walk or jog along the shoreline through gardens and fruit groves. Transportation: Metro Line 2 opened its Orange Island station in 2014. Other than by taxi, this is the easiest way for most tourists to go there. You could also take a scenic walk to the island across the No. 1 bridge. Opening times: 7 am to 11:00 pm. Internal transportation: there are park buses. The Yuelu Academy: The most popular park other than Orange Island is only a mile away across the river to the west. It is on a hill on Hunan University&apos;s campus. It is a national historical site as well because it was one of the first four universities and founded in 976. Huangxing Road (黄兴路) Pedestrian Street: You can go there for dinner and souvenir hunting after Juzi Island. The highlight on the street are the little Chinese shops that give a wide selection and economical prices and the little restaurants and snack stands. Hunan Provincial Museum is one of the foreign tourists favorites because of the quality of the exhibits and its size and comprehensiveness. It is only about 2 km east. Juzi Island is a regional attraction. It is most beautiful in April when the gardens and fruit trees bloom and in October and November when the orange trees bear oranges and the autumn scenery can be seen. To avoid crowds, avoid the public holidays and weekends. Schools and universities let out for summer vacation in July, and there is an influx of children and young people until August. Tips: On sunny days, have sun protection. There are long lines for the shuttle buses. We suggest you take your own drinks and snacks to avoid high prices and limited selection. Metro Line 2 opened its Orange Island station in 2014. Other than by taxi, this is the most convenient way to go there. It is also quite economical. 7-Day Hunan Tour: Visit Changsha, Wulingyuan, Fenghuang, Yuelu Academy, and Mao&apos;s hometown. We could add Orange Island on your itinerary per you specification. See our Changsha Tours: We can customize all our tours for you, and our guide will help you travel and enjoy your time.